As a Doctor, Dentist or any other Healthcare Professional, you already know ranking well in the search engines is essential to the success of your private practice. With over 70% of patients starting their search for a doctor, dentist or other healthcare providers online, if you’re not ranking well on page one, you’re going to be ignored. SEO has played a big role in the success of my health care center that I helped co-found in 2007. And over the last ten years, I’ve seen the highs and lows of search engine rankings. I’ve worked with many SEO agencies, freelancers, and “experts.” Some were good, and some were bad, and some were ugly. So, today I want to give you some things to consider before getting into a relationship with any SEO company. The reason I highlight this first is that the human element often gets overlooked in SEO. We know search engines are these complex robots in silicon valley, but we can’t forget the human factor on the other side of a search result. Patients are out there, in need, looking for help, and it’s our fiduciary responsibility to make sure they can find the help they are looking for. As you know, in healthcare, we are dealing with sensitive topics and information. We need to work with an SEO company who has some sort “bedside manner” and some understanding of what is appropriate and what isn’t when it comes to healthcare SEO. Like in any industry bragging about your service is a bit of a red flag. Claims like “we’ll get you on page 1 of Google” or “guaranteed results” are claims you’ll want to steer clear of. Especially watch out for these claims if you’ve got them in a spammy email, we’ve all seen those before. SEO takes time so anytime someone promises you massive results in a matter of weeks is probably selling snake oil. This one may seem counter-intuitive. Often, when you search your area for an SEO company, for example, “best SEO company in Boston,” you’ll find a company who has been able to optimize their site for that single key phrase and may not necessarily be good at ranking your dental site or optometry site that well. Just take the results for “top SEO in Denver” or “best SEO company Berlin” with a grain of salt, as they may be great at ranking that one phrase but not much else. Ok so if Google isn’t a good filter, who is? This leads us to my next point. Asking people you know or other local companies who have had success with ranking their website for a reference is a great place to start. If you are are a dentist, you could search for well-ranking physiotherapist, or another noncompetitive business in your area and reach out to them to see if they can refer you to their SEO company. One reason why it’s good to work with someone local is that search today is very localized and these local SEO companies often have some connections to local organizations that can help rank your site. Local connections to your site signal to the search engines that you are a relevant business in the area. We don’t want to do SEO for SEO’s sake. For any local business, SEO is a means to an end. Do you want more traffic or do you want more customers? Those are two different goals and often get confused as the same thing. Maybe you want to increase your volume of teeth whitening clients, promote a new dental implant service, or improve your online reviews. Knowing your most important goals will help the SEO company give you the best strategy to help achieve these. What’s a bad SEO goal? On the surface, these might seem to be reasonable goals, but they are not tied to any specific business outcomes. Make sure your goals are related to where you want to take your business. It’s easy to get sidetracked by vanity metrics, such as “oh look more web visits” or chasing the rankings of competitors, which again may not be linked to revenue or increase in patient volume in your practice. Once you are clear on your goals, we can work out our budget. Pricing for SEO services can range from $5 to $15,000 a month. The most important thing to consider when setting a budget is your Return on Investment. If an SEO improvement can bring you 5 – 10 – 50 new patients a month, what is that worth to you? By determining the lifetime value of your patients and working backward from there, will give you an idea of what your budget should be. Also, SEO is a long game, so you’ll want to budget for at least a 6-month commitment. Often SEO companies charge on a monthly basis, so if you are new to this, just start small, find a company or freelancer that can help you for a small amount, like $500 – $1,500 a month. See how they communicate and what type of small wins you might see and then double down after that if you see results. In the short term, the SEO return on investment is often hard to track. So what you are really buying are the deliverables/reports that an SEO company gives you. You want to be sure that you are going receive consistent communication and deliverables bi-weekly or at the very least monthly. You’ll want to see some sample reports, and sample itemized actions they are taking each week so you can have some visibility on what is happening. When it comes to deliverables, an exported report from google analytics or a report of where your keywords are ranking isn’t going to cut it. You’ll want to see more detail about what actions were taken that will help get to your goal. Also, remember that what happens to your rankings on search engines is somewhat out of your control, but what is in your control are things like, optimizing your site speed, or publishing content or collaborating with other local websites, all of which will have an impact on your SEO efforts. So focus on what is in your control within the SEO process, measure these things in addition to what is happening outside your control, like the position you have on google. These reports will add transparency and peace of mind to the process. Without getting some clear sample reports upfront, just forget it and move on to someone else. 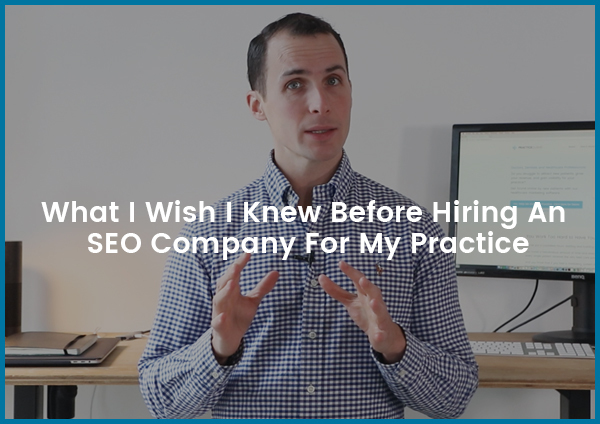 You’ll want to get some testimonials and case studies from the SEO company to help vet them and see if they are a good choice for your type of practice. Just make sure the testimonials are transparent, with the person or company’s full name. Feel free to reach out to these sources to confirm the quality of the SEO’s work. As I mentioned above, you have to play the long game when it comes to SEO. While there are often some quick fixes that can be done to your site, it can still take a long time to see excellent results. But, don’t let that get you down. SEO is a worthwhile investment and one that has served me very well over the years. Have you made any of these mistakes too?